Kirchweih: the earliest Kirchweih (church dedication festival) of the year starts in NEUPETSCH; the most original Kirchweih dances which are still performed are also found in NEUPETSCH; the last Kirchweih of the year is celebrated in ALEXANDERHAUSEN; the most beutiful Kirchweih hats are worn by those living in BENTSCHEK; the most decorated hats are worn by BILLEDers; the most beautiful traditional costumes are worn by the girls of GUTTENBRUNN; the men from LIEBLING have the oldest men's traditional costumes; the women's costumes in LOVRIN are lovely; the most admired girls' costumes are worn by the girls of GOTTLOB. This commentary is found in the 1924 Donauschwäbischer Volkskalender, titled: Our Danube Swabian Banat Villages Have Their Own Character By Prof. Nischbach, subtitle: Various characteristics of the Banat Swabian Villages. The word Kirchweih is derived from Kirche = church; weihen = to bless, or to consecrate. When the construction of a church was finished, church services were being held there as soon as possible. Eventually the church was always blessed or consecrated by the bishop. Sometimes it took several years before the bishop had the time to go from village to village to bless or consecrate the church. The consecration or blessing of a church usually took place on a weekend. As an example, if a church was blessed on Sunday, October 15, 1850, and October 15 in 1853 would fall on a Wednesday, the Kirchweih would be celebrated on the Sunday following that Wednesday. 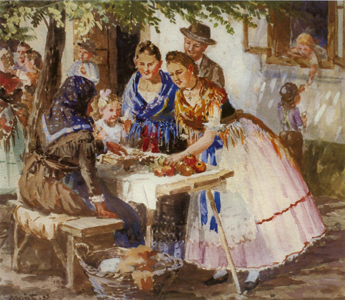 Some Kirchweih dates were later moved to the fall, so that they would not interfere with the work in the fields. 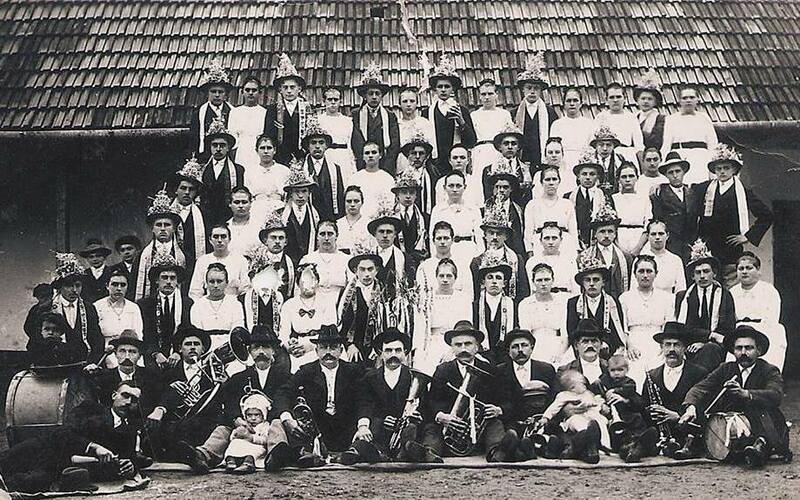 Eventually Kirchweih became the most important annual secular festival in every village. 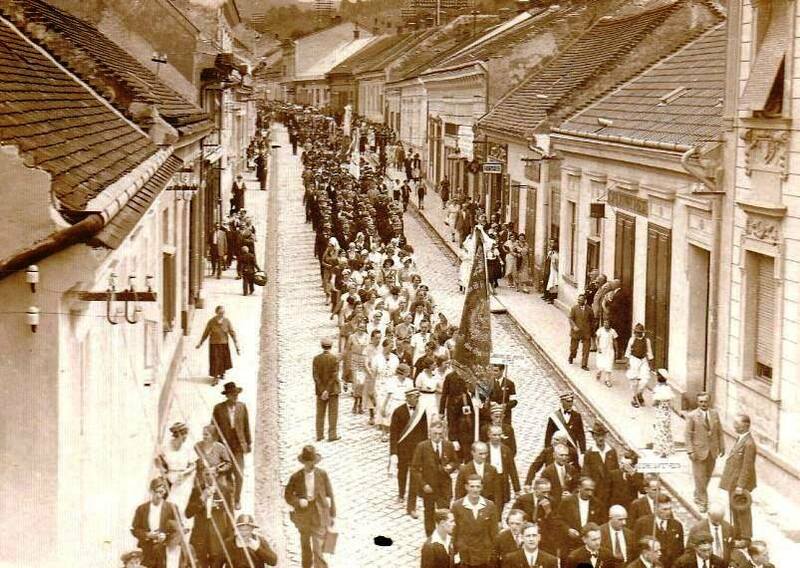 To accommodate visitors from other villages, Kirchweih was celebrated on a different weekend in each village. 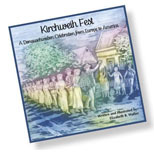 Kirchweih Fest: A Donauschwaben Celebration from Europe to America illustrated narrative by Elizabeth (Elsa) Walter is now available! The illustrations in this colorful, hard cover book are aquatinted etchings, depicting the way Kirchweih was celebrated Drhaam, and today in our new home in America.